ANAHEIM, Calif. (AP) — Andrelton Simmons homered and made more than one spectacular defensive play. Eric Young Jr. homered and made a phenomenal play with his glove as well. 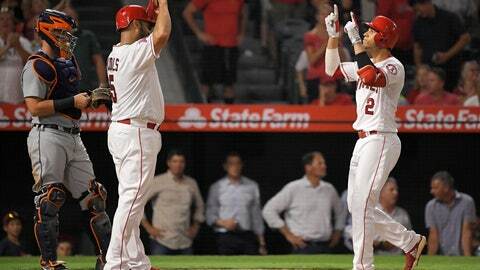 The Angels‘ star shortstop was more than willing to cede the spotlight to his journeyman teammate after a revitalizing win for Los Angeles. Simmons hit a two-run homer and dazzled in the field to lead the Angels to a 6-2 victory over the Detroit Tigers on Monday night. Nicholas Castellanos hit a first-inning homer, but the Tigers managed just three hits as their offensive slump continued. Detroit has scored just three runs over 39 innings while losing the first four games of its California road trip. After Tropeano’s abrupt departure, Angels reliever Noe Ramirez allowed four straight baserunners, culminating in Jose Iglesias’ RBI single. Cam Bedrosian took over and escaped the bases-loaded, no-outs jam with a strikeout and a hard-hit grounder by Jeimer Candelario that was turned into a double play by Simmons’ superb throw in the pivot . Simmons made another impressive defensive play in the eighth, diving to snag James McCann’s liner. Trout got a cortisone injection in his wrist Monday, likely ruling him out for this series — including the game on his 27th birthday Tuesday. Manager Mike Scioscia is hopeful Trout will feel good for the Angels’ weekend series against Oakland after an off day Thursday. Shohei Ohtani went 0 for 2 with two walks as the Angels’ designated hitter, equaling the number of walks he drew in his previous 16 games combined. But Ohtani’s recovery from his sprained elbow ligament is progressing more quickly than the Angels hoped, Scioscia said. Ohtani is throwing from 120 feet. The club still has no timetable for getting its two-way rookie sensation back on the mound, but it is likely to be sooner than the club initially expected internally. Tigers: Jacob Turner makes his season debut in Mike Fiers’ rotation spot after being recalled from Triple-A Toledo in the wake of Fiers’ trade to Oakland . Turner is a former top Tigers prospect who was traded in 2012, but returned on a minor-league deal this year. Angels: Andrew Heaney (6-7, 3.75 ERA) makes his second career start against the Tigers after taking a loss May 31 in Detroit. He’s a rare constant in the Halos’ tumultuous rotation, setting career highs already with 20 starts and 122 1/3 innings pitched.